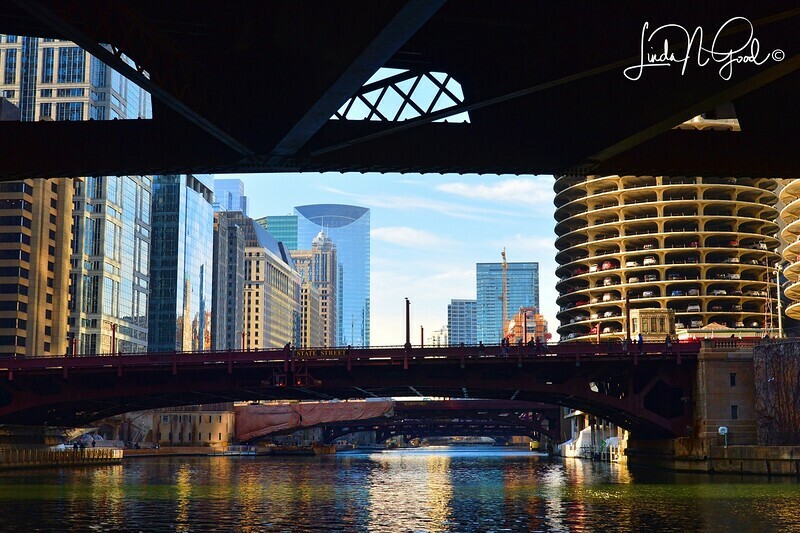 As we were walking around a very, very cold Chicago looking for good photo backgrounds for Ashlee’s Senior photos, I saw this scene and it just struck me that the framing from the bridge was really nice to showcase the river and the buildings beyond. As you can see we were near State Street. Chicago has long been one of my favorite cities. Although, I think I’ll visit the city in the Spring next time. Thank you for your comments and critiques, very appreciated. Stunning cityscape !! Beautifully framed !! Certainly a great vantage point to shoot from !! Very well seen Linda, outstanding! Interesting PoV. Makes a very interesting composition. Interesting view which leaves a good place for the signature !! Excellent framing; creates a rather dramatic effect...beautiful tonality on the water and the window reflections! Very nice framing of the city in this shot. I like all the vertical lines of the skyscrapers, juxtaposed with the round parking structure.